Unfortunately, despite our best efforts, teeth can sometimes be impossible to save. 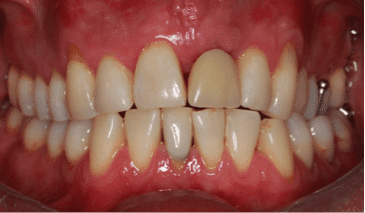 If cavities have become too deep, or damage has become too extensive, often extraction of the tooth is the only answer. Losing a tooth doesn’t have to be the end of the world, and it doesn’t mean you have to stop yourself from smiling in public for the rest of your life. Jackson’s front tooth was damaged approximately 10 years ago in a football game. At the time of the incident, his tooth was treated with root canal therapy and a crown – both of which had failed after a 10-year stint. The tooth was no longer viable to keep, and Jackson was worried about the aesthetic implications of loosing his tooth. The team at dHealth Dentistry in Camberwell suggested an implant as the best way to overcome the aesthetic and functional side effects of losing a tooth. Step 1: After an initial discussion with Jackson, the team at dHealth decided that best option for Jackson was a long-term investment – a dental implant. Step 2: After an implant was decided on, we had to assess the viability of Jackson’s jawbones for placing the implant fixtures. If his bones were unable to cope, another form of treatment would have been used. Step 3: Jackson passed the viability test, so we implanted the fixtures and asked Jackson to come back in eight weeks for an assessment. Step 4: The review showed that the fixtures were fitting in perfectly, so Dr Danylak inserted the new implant crown and gave Jackson a full whitening treatment as well as a laser gum lift. 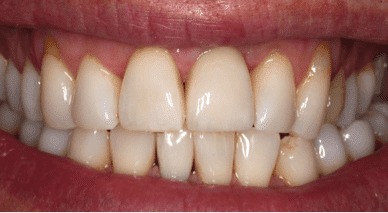 Plus internal whitening lower front tooth.